The youth of today did their best to ignore the embarrassing old man. A look into the future to the candidates' reaction to the announcement of who will face David Davis in the members' ballot. Clarke's campaign gets dirty having presented Cameron and Fox good luck gifts from Tie Rack. 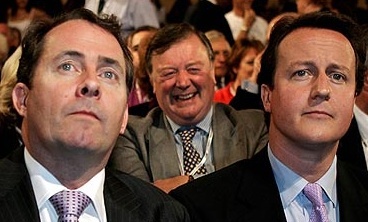 Liam Fox was completely fooled by Ken Clarke's lifesize "David Cameron" doll. Why Ken Clarke wears winklepickers. Did Ken just put a "kick me" sticker on both their backs? Little did they know, but a wily prankster had removed the 'wet paint' signs from Liam and David's chairs. Who put the ExLax in the coffee? Who has been on the beer and peanuts again! Two leadership candidates put a brave face on hearing that the tennis court is to be replaced with a smoke filled bar. Ken Clarke: "I do say, who are the funny men sitting in front of me"